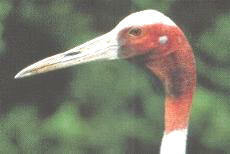 In Australia the Sarus Crane is observed most readily in the Atherton Tablelands district. It is present there from May to December. For the remainder of the year it nests on the marshy plains round the Gulf of Carpentaria. During the day it forages in large flocks on agricultural fields, searching for various food items including shoots, tubers, seeds, insects and small vertebrates. Traditional roosts are occupied each evening, where the birds sleep while standing in shallow water. The best known is Bromfield Swamp on Upper Barron Road near Malanda. At sunset hundreds of Sarus Cranes can be seen gliding in to roost in the Bromfield Swamp. On the Atherton Tablelands its numbers may be increasing. In 1998, a count by Birds Australia discovered that at 11 different sites across the Atherton Tablelands 1844 cranes were counted. Sarus Cranes constituted 1255 of these, 139 were Brolgas and a further 450 were unidentified. Australia's estimated Sarus Crane population is 5000, which means between one third and one quarter of Australia's Sarus Cranes were counted on that one day. It differs from the Brolga in several ways, in particular by the greater amount of red about the head.